Indie artist Peter Kuper sends Bart on an incredulous journey when a monster firecracker leaves Bart deaf and dumbfounded. Then, Carol Lay delves in Bart’s future with the help of a carnival and a crystal ball. Also, Evan Dorkin presents a tale of Bart and Milhouse and a new video game that somehow manages to stay just out of reach. Plus, “Maggie’s Crib” by Sergio Aragones. The 15-page main story for last summer’s Bart Simpson #54 was not the first time Peter Kuper has handled The Simpsons. 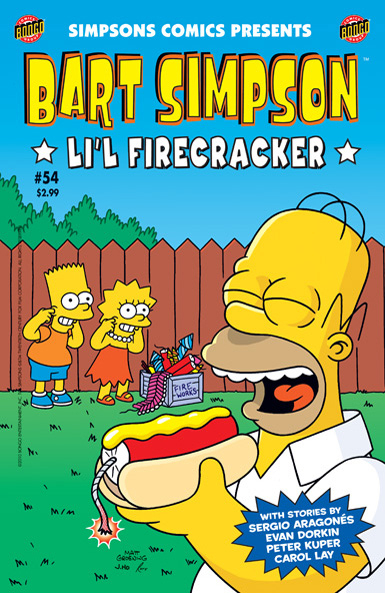 He’s also contributed to Bart Simpson’s Treehouse of Horror, an annual comic similar to the animated series’ tradition of twisted humor mixed with the sorta-macabre. But he’s probably best known for his paranoid style of art that has been seen on covers of Time, Newsweek and other magazines. He also the current writer/artist for Mad Magazine‘s “Spy vs. Spy” comic strip. He has created award-winning graphic novel adaptations of Franz Kafka’s The Metamorphosis and Give It Up, as well as his own original graphic novels like Diario de Oaxaca and Stop Forgetting to Remember. Unfortunately I couldn’t find any samples of Peter’s story and haven’t read it myself, so I can’t really comment beyond saying that he’s a great artist. Billy Tucci is best known for his ninja comic Shi, which debuted in the “bad girl” days of comics in the 1990s. Here he takes on a style with which he is not usually associated and it’s a refreshing change. 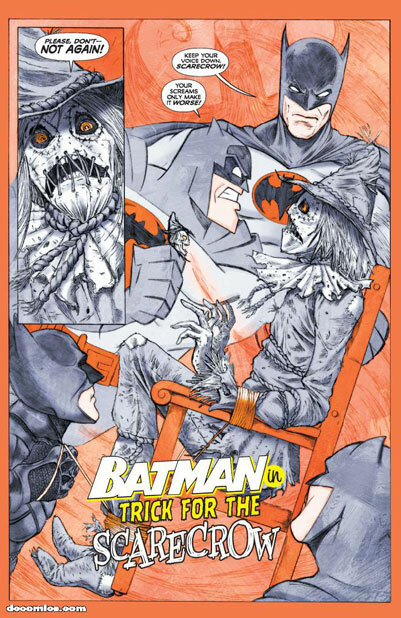 The story itself is a pretty fun use of kids in costumes and the Batman villain Scarecrow’s defeat by his own weapon, chemicals that induce nightmarish hallucinations based on the victim’s fears. There’s also a neat use of the color orange throughout. There are two nominees in this category from the Fractured Fables anthology released last summer. 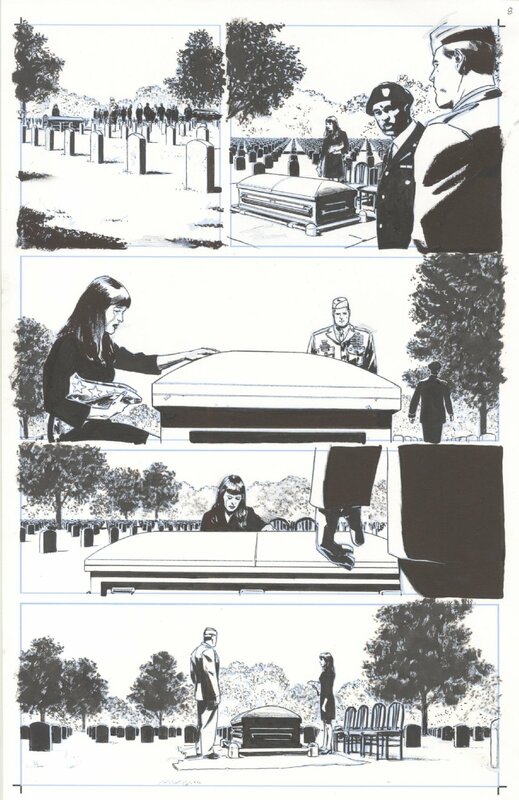 This one is by Nick Spencer and Rodin Esquejo, both known for their collaboration on the Image Comics hit Morning Glories. (Both creators and Morning Glories are up for several other Eisners as well. Nick Spencer is obviously a writer to watch, having also recently signed an exclusive contract with Marvel Comics in addition to his creator-owned material with Image.) Rodin is that series’ cover artist, so it’s good to see him do sequential work here, and it’s just as lush and beautiful as I hoped. Like the title of the anthology suggests, each of these stories is a slightly off-kilter interpretation of classic fairy tales and fables, so Rodin’s artwork serves as the straight man to Nick’s silly take on Cinderella. It’s also great to see so many humor stories getting acknowledged. Despite the fact we call them comic books, a lot of them are almost too serious. Unlike the two above nominees, Fractured Fables is still readily available (here’s the Amazon listing). Unfortunately the other two only appear in comic books that may be available at local comic book stores or on secondary markets like eBay. It appears to be a beautifully told story. Popgun Vol. 4 (and all 3 previous volumes) is still available. Here’s the Amazon listing, already updated to reflect the Eisner nomination (they move fast!). The second nominated story from last summer’s Fractured Fables – sounds like a book worth getting! This story is illustrated by Sky Pirates of Neo Terra artist Camilla d’Errico, whose art inspired and was the basis for the video game of the same name. Writer Bryan Talbot is also a talented artist who has created challenging graphic novels, a narrative form he helped establish, like his most recent works, Alice in Sunderland and Grandville. As with the other stories in this anthology, the focus is on a humorous take of a well-known fairy tale. Knowing Talbot, it’s probably quite clever and smart. Here’s the Amazon listing again. So that’s it for the Best Short Story category. Some nice variety: comedy, superhero, all-ages, slice of life. Who do you think should win? Have you read any of these stories?